Seaspray Ave, Woolamai. Victoria 3925. 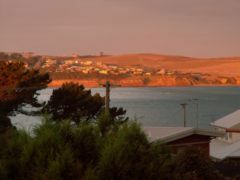 The Beach Penthouse is located in a quiet street in Woolamai, on the top floor of a two storey property with majestic views of the mouth of Westernport Bay and San Remo. Enjoy the panoramic views of the ocean and at night, the lights twinkling on the hill of San Remo and reflecting on the moonlight waters. Just a short stroll of the long sandy shore of Woolamai Safety Beach, and the famous Woolamai Surf Beach is about one kilometre away with some of Australia's best surf and great surf fishing. 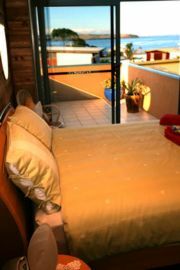 If a romantic getaway is your desire, the Beach Penthouse has a lot to offer. 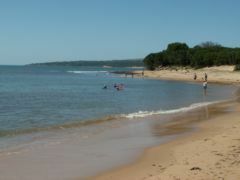 Beautiful San Remo is just a short 5 minute drive over the bridge. Walk the retail area, cafes, restaurants and along the water front promenade to the jetty and watch the pelicans being fed at 11.30am every morning or view the fishing boats coming in. Visit the Nobbies, GP circuit visitors centre, Koala Conservation Centre, Churchill Island, Phillip Island Wildlife Park or the world famous Penguin Parade, which are all within a ten minute drive. Phillip Island has 101 kilometres of coast line and has some of the best pristine beaches for you to swim, surf fish or just explore. 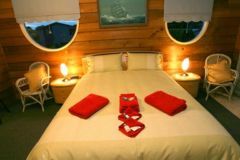 The Black Dolphin Beach Penthouse offers first class luxury full self contained accommodation for couples. 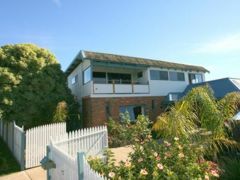 The large open living area is complemented by quality furnishings, reverse cycle air conditioning and a fully covered balcony overlooking the pristine waterway between Phillip Island and the main land. The Beach Penthouse has two spacious bedrooms, both with quality queen size beds and a spacious modern bathroom with a double spa. 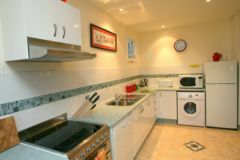 A fully equipped kitchen with dish washer, microwave and Stainless steel appliances. 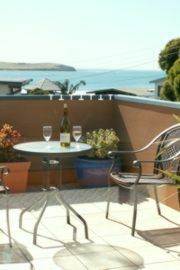 The Beach Penthouse is absolute quality for the discerning guest and has everything you could wish for to make your break on Phillip Island even more memorable. Joy & John Bardsley; Peterborough; Ontario; Canada. 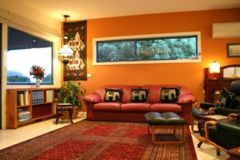 We've had the opportunity to travel to many countries around the world and 'The Black Dolphin Beach Penthouse`rates 5 STAR - TOP NOTCH as 'Home away from Home` Accommodation and Hospitality. We are honoured to be the 1st visitors. A Perfect Place to Celebrate our 37th Wedding Anniversary. Kudos to Lydia & Nigel for this Awesome Experience. The Black Dolphin Beach Penthouse is available in either 1 or 2 bedroom configuration. The following tariffs reflects these configurations. Hot Deal 3 nights $540 . Hot Deal 4 nights $680 . Loaf bread, margarine,cerial, museli, yogurt, milk, 6 rashers bacon, 6 eggs, orange juice, jam, & fruit. Enough for 2 morning. No breakfast $40 less. 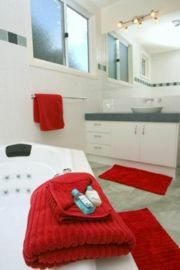 HIGH SEASON: Christmas Holidays (subject to min stay), Easter 4 night min; Long Weekends 3 night min, Super Bikes & Special Events. Price on Application for MotoGP. Feel free to fill in the form below to either book your stay now, or to request any further information. We would be glad to respond as soon as possible and thank you for visiting this page! Please complete the following form as fully as possible. Thankyou for filling in this form. Please press the send button and we will respond to you as soon as possible.